June 5 Robert Zubrin was the keynote speaker at the Ethanol Promotion and Information Council’s (EPIC) annual meeting in Omaha. March 4 Gal Luft, Robert Zubrin and Cliff May spoke at an energy security panel at the Republican Jewish Coalition annual leadership meeting. Nov. 29 Robert Zubrin embarked on a book tour for his new book Energy Victory. He appeared at the Ethics and Public Policy Center in Washington. Nov. 29 Gal Luft spoke at a Heritage Foundation panel on the implications of the Sunni-Shiite divide on the future of oil. Watch here. Nov. 28 Gal Luft appeared at a Brookings Institute panel celebrating the release of Blindside. Gal Luft and Anne Korin contributed a chapter to the book. To buy click here. Sept. 19, 2007: James Woolsey and Anne Korin spoke at IEEE's plug in hybrid conference, co-hosted by Set America Free. July 17, 2007: Gal Luft appeared before the Senate Values Action Team. July 16, 2007: Gal Luft, Gary Bauer and Cliff May spoke at the annual convention of Christians United for Israel. July 12, 2007: James Woolsey, Bud McFarlane, and Sen. Tom Daschle spoke at the 2020 Vision Energy Security Summit. July 12, 2007: Frank Gaffney testified on plug in hybrids before the House Select Committe on energy independence and Climate Change. July 10, 2007: Anne Korin spoke in Atlanta. July 10, 2007: Plug in hybrid Hill briefing with IEEE. July 3, 2007: Jim Woolsey spoke at the Aspen Ideas Festival. June 20, 2007: Robert McFarlane spoke at a joint Hill briefing with the Partnership for Secure America. June 19, 2007: Gal Luft spoke in Long Island. June 7, 2007: Capitol Hill visit and briefing by Silicon Valley Leadership Group. June 6, 2007: Anne Korin spoke in New Orleans. June 5, 2007: Anne Korin spoke in Dallas and San Antonio. May 25, 2007: Set America Free briefing in the House of Representatives featuring Dr. Paul Werbos of the NSF and IEEE. May 22, 2007: Primary Energy '08 Inaugural Event featuring Senator Sam Brownback. May 20, 2007: Anne Korin speaks at RJC event in Atlanta. May 14, 2007: Gal Luft speaks at Rice University Energy Security Forum. May 13, 2007: Set America Free event in Houston. May 10, 2007: Set America Free briefing in the Senate featuring Dr. Steve Paul of Princeton on biofuels beyond ethanol. May 7, 2007: Set America Free event in Seattle. May 7, 2007: Jim Woolsey, Anne Korin, Gal Luft, Felix Kramer spoke at Cascadia Center's Jump-Start to Clean Energy Conference in Washington State. May 3, 2007: Anne Korin spoke at World Affairs Council in Naples, FL. 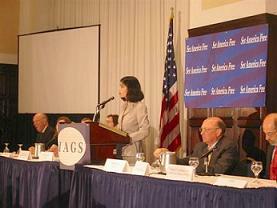 May 1, 2007: Gal Luft spoke at AJC conference in Washington Dc. April 30, 2007: Gal Luft spoke at Rep. Steve Israel's Energy Security Forum in Long Island. April 22, 2007: Set America Free event in Livingston, NJ. April 19, 2007: Set America Free event in New York. April 19, 2007: Two Set America Free events in Miami. April 13, 2007: Set America Free briefing in the Senate: "Fuel Choice in the Transportation Center", featuring Col. Bill Holmberg of ACORE and Greg Dolan of the Methanol Institute. April 10-12, 2007: Orson Swindle, Anne Korin and Gal Luft, spoke at the Federal Trade Commission's conference: Energy Markets in the 21 Century. March 29, 2007: Jim Woolsey spoke at Yale University about "Energy, Security and the Long War of the 21st Century." March 27, 2007: Anne Korin briefed the Committee on the Present Danger. March 24, 2007: Robert McFarlane gave a keynote address at the Energy Summit in Denver. March 22, 2007: Jim Woolsey briefed the Edison Electric Institute's Electric Transportation CEO Taskforce. March 12, 2007: Set America Free hosted Jewish leaders in Washington. March 5, 2007: Set America Free event in Metro Park, NJ. March 4, 2007: Set America Free event in Princeton, NJ. February 28, 2007: Set America Free event in San Francisco. February 17, 2007: Set America Free event in Miami, FL. February 15, 2007: Set America Free event in Palm Beach, FL. January 18, 2007: Set America Free Congressional briefing featuring Thomas Friedman. January 12, 2007: Set America Free members appear before the Stanton Coalition. January 8, 2007: Set America Free Congressional briefing. December 17, 2006: Set America Free event in St. Louis, MO. December 12, 2006: Set America Free event in Philadelphia. December 12, 2006: World Affairs Council, North Carolina. November 27, 2006: Set America Free event at Yeshiva University. November 15, 2006: Set America Free event in Los Angeles, CA. November 14, 2006: Participated in plug-in conference in Napa Valley, CA. October 19, 2006: Book event for Edwin Black's Internal Combustion. October 19, 2006: Set America Free event in Philadelphia. October 16, 2006: Silicon Valley CEO Summit on Energy Security. October 5, 2006: Educational event in Los Angeles, CA. October 4, 2006: Educational event in Orange County, CA. September 18, 2006: Coalition co-hosted Al Gore speech in NY. August 6-11, 2006: Drive Beyond Oil 18 city tour. July 21, 2006: Anne Korin appeared before the Heritage Foundation. July 19, 2006: Energy Security Summit. June 28, 2006: Blue Dogs Coalition briefing. June 26, 2006: Who Killed the Electric Car Washington DC screening. June 16, 2006: Addicted to Oil premiere at the SilverDoc Film Festival. June 8, 2006: Museum of Tolerance Los Angeles. June 6, 2006: Deron Lovaas testified at House Science Committee field hearing held in Naperville, IL. May 31, 2006: Dependence day. May 16-18, 2006: Washington DC plug in hybrid electric vehicle demonstation. May 2, 2006: AJC held a Set America Free briefing during its annual event. April 28, 2006: Anne Korin spoke at Mercyhurst College in PA.
April 27, 2006: Anne Korin spoke at the World Affairs Council in Pittsburgh. April 24, 2006: Anne Korin spoke in Southern New Hampshire University along with Senator Brownback. April 5, 2006: Gal Luft spoke in Delaware. March 22, 2006: Anne Korin spoke in Portland, OR. March 20, 2006: Set America Free held House briefing on biofuels. March 17, 2006: Anne Korin spoke at the World Affairs Council in Hilton Head. March 15, 2006: Anne Korin spoke at the World Affairs Council in Columbia, SC. March 14, 2006: Gal Luft spoke in Wilmington, NC. March 10, 2006: Senator Chaffee and Anne Korin spoke in Providence, RI. March 2, 2006: Anne Korin testified before the House International Relations Committee, Subcommittee on the Western Hemisphere. February 24, 2006: Robert C. McFarlane presented the Set America Free vision to the NATO Forum on Energy Security. February 3, 2006: Set America Free held a post-State of the Union House briefing detailing policies that would help reduce oil dependence. January 25, 2006: Set America Free held two back to back Congressional events, one in the House and one in the Senate, presenting the national security imperative of reducing dependence on oil and explaining what can be done. January 24, 2006: James Woolsey and Frank Gaffney addressed Plug In Partners launch event. January 24, 2006: Frank Gaffney addressed The Heritage Foundation. January 17, 2006: Anne Korin addressed Richmond, VA World Affairs Council. December 8, 2005: Frank Gaffney and Gal Luft addressed House Science Committee members and staff on "Energy Security and Plug-in Hybrid Vehicles". November 17, 2005: Anne Korin addressed the American Public Power Association's symposium on plug-in hybrid electric vehicles. November 16, 2005: The Honorable James R. Schlesinger and the Honorable R. James Woolsey testified before the Senate Committee on Foreign Relations, on the High Costs of Crude: The New Currency of Foreign Policy. Click here for testimony. November 16, 2005: Announcing Bipartisan House and Senate bills based on the Set America Free blueprint. Click here for photos. November 7, 2005: Dr. Gal Luft addressed a congressional briefing titled "Liberating America’s Foreign Policy: The Case for Energy Reform" organized by the House Renewable Energy and Energy Efficiency Caucus. October 20, 2005: Dr. Gal Luft testified before the Senate Committee on Foreign Relations, on U.S. Foreign Policy, Petroleum, and the Middle East. Click here for testimony. October 18, 2005: Anne Korin addressed the Columbus Council on World Affairs. October 17, 2005: James Woolsey, Gal Luft, and Deron Lovaas addressed the American Council on Renewable Energy's policy conference. October 7, 2005: James Woolsey gave two speeches at Southern Methodist University in Dallas, TX, "Defeating the Oil Weapon" and "The Long War of the 21st Century: How We Must Fight It". September 20, 2005: Dr. Gal Luft testified before the Senate Committee on Foreign Relations. Click here to read his testimony. July 27, 2005: Dr. Gal Luft testified before the Congressional U.S.-China Economic and Security Review Commission (USCC) on China's pursuit of oil and the implications for global security. Read his testimony here. July 27, 2005: Dr. Gal Luft testified on terrorist threats to energy security before the International Terrorism and Non-Proliferation Subcommittee of the House International Relations Committee. To read his testimony click here. July 14, 2005: Frank Gaffney participated in a panel on The Coming Energy Wars: A 21st Century Time Bomb? at the Heritage Foundation. July 14, 2005: Dr. Gal Luft spoke at a briefing in the House of Representatives on Biofuels and the Energy Bill: Opportunities for Reducing US Oil Dependence. July 13, 2005: The House Armed Services Committee invited Coalition members Frank Gaffney and James Woolsey to testify on the national security implications of the merger between Chinese oil company CNOOC and U.S. oil company Unocal. July 8, 2005: Anne Korin, co-chair of the Set America Free Coalition, addressed an energy policy conference hosted in Aspen by the New Century Transportation Foundation (NCTF). 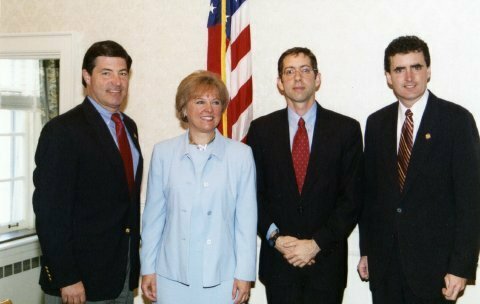 July 6 and July 7, 2005: Congressman Jim Gerlach, (R-PA) hosted two energy policy meetings to address the country's need to become less dependent on foreign oil resources. Dr. Gal Luft spoke to the audience about the importance of using a wide variety of domestic energy resources rather than funding with our oil dollars Middle Eastern countries that sponsor terrorism. June 10, 2005: Set America Free briefing to Senate staffers. June 7, 2005: Set America Free briefing to the Senate Centrist Coalition. Luft: The True Cost of a Gallon of Gas? Why Is Oil So Pricey? It's a Conspiracy! Is alcohol the energy answer? Anne Korin took part in the program To the Point on the topic: Is America's Thirst for Expensive Oil Fueling Dictators? Luft and Korin: The big lesson Iran can teach the U.S.
Will defeat in Iraq herald a repeat of post-Vietnam economic ills? Would You Like A Gas Guzzler With That? Luft: What should Bush say to the Big Three? Since when are our oil woes the fault of China? Oil: Al-Qaeda's Next Terror Target? Is Oil Independence Attainable and Desirable? Luft: An Energy Pearl Harbor? Tom Friedman: Will Pigs Fly? Bush's plan to wean US off imported oil: ambitious enough? Morton Kondracke: Does Bush really back new energy, environment policy? Who's getting juiced about plug-in hybrids? India And China: Oil-Patch Partners? United States: Bombs or bombast? Will China, US Have to Compete in Global Search for Oil?